Psalm 138. Psalm 104. Daniel 4:33-37. Isa. 45:1-7. Romans 8:28. 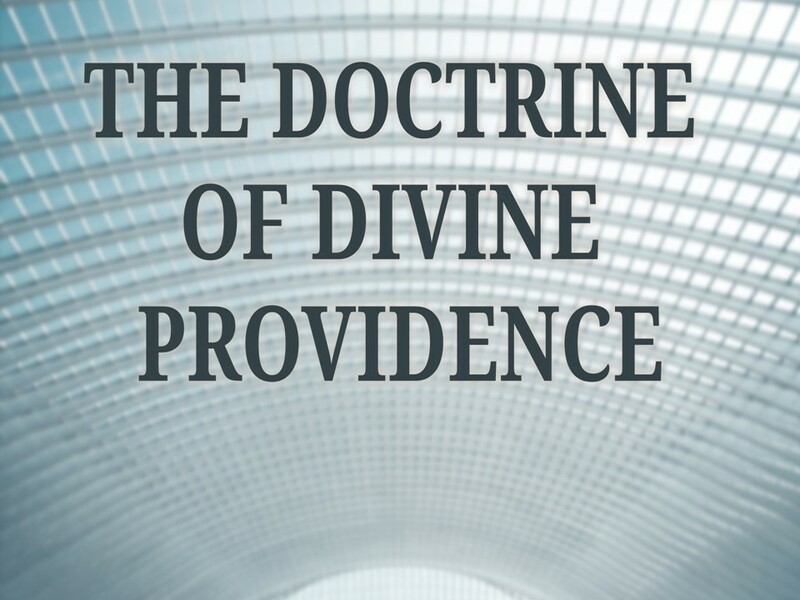 One of the topics in this present request series I’ve been asked to address is the doctrine of Providence. Since this is the theme for this year’s Sunday School, Ben thought it good, and so did I to give some foundation to what many of your children will be exploring this year. And how that is to be precisely understood has been noted by virtually every theologian throughout the centuries. Charles Hodge: God’s works of providence are his most holy, wise, and powerful preserving and governing all his creatures and all their actions. Wayne Grudem: We may define God’s providence as follows: God is continually involved with all created things in such a way that he (1) keeps them existing and maintaining the properties with which he created them; (2) cooperates with created things in every action, directing their distinctive properties to cause them to act as they do; and (3) directs them to fulfill his purposes. Before we got too far – NOTE: The text does not say all things ARE good in and of themselves. Positively: What is being said is that all things – BOTH good and bad, are so governed by God, as to be made to work for the good of those who are His own. Negatively: There is no such thing as chance (accident), randomness or fate in a universe personally administrated by God. So in this, we retain the reality that there really are both good AND bad things that happen to God’s people. God orchestrating them for our good does not negate the reality of truly bad and evil things. Unfortunately, some have erred in this regard, and turn God’s providence into fatalism – since God is directing everything anyway, and since I have no say in it, therefore I am not responsible for my own actions. Or, they lose the ability to call anything evil, since in their minds – God stands in exactly the same relationship to sinful actions by men and demons as He does to making the sun rise and the rain to fall. So some get caught in a confusion that leaves them knowing some things are bad, but think they have to deny that in order to be theologically correct. But the Bible NEVER excuses any person’s acts on the basis of God’s sovereign providence or control, nor does it deny the reality of evil. The amazing wonder is, God rules in such a way that even the free actions of men are comprehended within His plan and ultimate purposes, but not so as to rob anyone of true moral responsibility. To err here is to make a real hash of all sound theology and make God a puppet master or monster, or even the author of evil itself. By the doctrine of God’s providence, what we are acknowledging is God’s actual and personal governance in everything which takes place within His universe. Nothing and no one, is exempt. Romans 8:29 “For those whom he foreknew he also predestined to be conformed to the image of his Son, in order that he might be the firstborn among many brothers. What we see here, is that there is orchestration in all events which impact Believers – a working together – not each individual part being the whole. One particular circumstance is not to be evaluated on its own, apart from other things. This orchestration is aimed primarily at one thing: Conforming the Believer to the image of Christ! So in this regard, we see Providence as multi-faceted, and we MUST NOT try attach a specific 1-to-1 reason for each and every circumstance. Trying to do this has made many a soul almost mad in trying to figure it out. Some events and circumstances can be seen to bless in immediately pleasing ways. The aesthetics of nature. Food tasting good. Beauty. Music. Wine and oil (Ps. 104) , crops that yield. Some events and circumstances are used to challenge us in unpleasant ways – testing in temptation that we might grow in grace. To build faith – as trusting in God’s character and promises. Some events and circumstance help wean us away from loving this present life too much, and living without regard for the future promised After the resurrection. Some events and circumstances reveal the fallenness and brokenness of this present world and the horrid results of sin. Some events and circumstances are meant to be precursors to final judgment. Some events and circumstances are designed to reveal hitherto undiscovered sin in the soul so it may be dealt with. Some events and circumstances serve to strip away all self-confidence that we might rely wholly upon Christ. Some events and circumstances are meant to reveal God’s care and intervention in the miraculous. Some events and circumstances are meant to disabuse us of mistaken notions of God and His Word. Voddie Baucham: “God wants me happy, and I don’t believe God would want me to stay in a marriage and be unhappy. Are you serious? ” “Let me see if I understand this correctly: Jesus Christ, the spotless, sinless Lamb of God, was crushed and killed for the glory of the Father, but you, He wouldn’t want unhappy. Some events and circumstances are meant to have impact beyond a single actor (like myself) but upon all those connected to it. God used Moses to mold the nation of Israel, and He used the people of Israel to mold Moses. Both are true. Assigning all of God’s work to just one or the other misses the point. And many events may be a mixture of any combination of these, and/or other purposes in the mind of God – BUT ALL AIMED AT OUR CONFORMITY TO CHRIST. Looking for a specific lesson beyond this central purpose from an individual experience – may be truly futile. The more general realities must take precedence. How do all of these things work together for the Believer? They do so as the Holy Spirit, intercedes for us in always praying in accord with The Father’s will in our regard – even when we can only pray with the immediate facts at hand. When we do not know how to pray best in our circumstance. What an amazing thing this is! The Spirit’s prayers on our behalf is something mysterious to contemplate. In reality, this is nothing other than a reference to the internal dialog of the Triune Godhead over the cares, concerns and needs of God’s people. It is an amazing thing to imagine isn’t it? That the God who spoke the universe into existence gives so much attention to we lowly and often rebellious creatures – but it is true. And if the Bible didn’t affirm it, it would be almost unthinkable. This is the extraordinary comfort and joy of the true Believer in Jesus Christ. The fact that God in His infinite and sovereign goodness, provides for us in all circumstances, does not mean we are somehow exempt from needing to enter into them purposefully in order to obtain their benefit. There is something of the Believer’s responsibility in it, to take advantage of the circumstances in faith – with God’s purpose (conformity to Christ’s image and the display of His glory) as the background. (12-13) We must be choosing to live for God’s spiritual ends in our circumstances, and not be bound to just the externals of the circumstances themselves. To live as though things are just good or bad based upon how we feel about them is to live according to the flesh – and that is death! It is NOT living the divine life He has given to us. 2. (13-14) We must not allow adverse or tempting circumstances to draw us back into sin – but use them as occasions to die to those sinful ways. The Spirit never leads anyone into sin. NEVER! 3. (15-17) We must look to the Father consciously in all of our various circumstances. Recognizing we are heirs with Christ and destined for glory. 4. (18) We must consciously compare our present distresses with the coming glory so that we are not mastered by them. Yes, God makes the rain to fall and provides the sun to shine and thus grains and fruits and vegetables grow – but we must harvest them, prepare them and consume them to receive the benefit of the sovereign provision He makes. And it is just so with His providence in our circumstances. Do I run to Christ? Do I look to overcome sin? Do I look to grow in grace and in the image of Christ’s character? Am I considering the eternal state to come while wrestling with the present circumstances? How can I use this to bless others? A Warning: The problem of trying to “read” providence as omens and signs. We can only really understand Providence AFTERWARDS, not before it unfolds. PROVERB: Once there was a Chinese farmer who worked his poor farm together with his son and their horse. While trying to tame one of wild horses, the farmer’s son fell, and broke his leg. He had to rest up and couldn’t help with the farm chores. “How sad for you,” the neighbors cried. “Maybe yes, maybe no,” said the farmer. Just because you suddenly connected with an old flame on Facebook, is not God’s indication you should leave your spouse and go be with them. We must go by Biblical principles, and not try to read providence like a crystal ball. God in His glorious goodness, causes all things to work together for the good for those who love Him and are called according to His purpose. This is the wonder of the joy and security of the saints. It is part and parcel of His personal administration of everything within His creation. But if you are not one of His today – this truth is not yours except in the sense that you experience what you do in order to drive you to Christ for salvation. By His Providence, God has infused every moment and experience of your life, to bring you to the place where you will call upon Him to be saved from your sin – won’t you run to Him today?